No matter which channel you turn to on television, you are likely to find some kind of visual element that seems to overpower the screen--making it difficult to focus on one thing. In the past few years, television stations have begun to reformat their screen presentations to include scrolling screens, sports scores, stock prices and current weather news. These visual elements are all designed to give viewers what they want when they want it. However, Kansas State University professors Lori Bergen and Tom Grimes say that it's not working. "Our conclusion has been that if you want people to understand the news better, then get that stuff off the screen," Grimes said. "Clean it up and get it off because it is simply making it more difficult for people to understand what the anchor is saying." Grimes and Bergen are both associate professors of journalism and mass communications. They have collaborated with Deborah Potter, head of the Washington, D.C., research firm Newslab, in a study on distracting visual information. The study focused on viewers' ability to digest content in the presence of distracting information on the screen. "We discovered that when you have all of this stuff on the screen, people tend to remember about 10 percent fewer facts than when you don't have it on the screen," Grimes said. "Everything you see on the screen--the crawls, the anchor person, sports scores, weather forecast--are conflicting bits of information that don't hang together semantically. They make it more difficult to attend to what is the central message." For their research, Bergen, Grimes and Potter conducted a series of four experiments that examined people's attention spans regarding complex and simple cognitive processes. "The outcome of all of the experiments was that people were splitting their attention into too many parts to understand any of the content," Grimes said. In 1990, Music Cable Television Network, or MTV, made its debut on cable television. Colorful graphics, young video jockeys and hip music seemed to be the key elements that captured viewer's attention. Robert Pittman, who created MTV, attributed the station's success to the ability of viewers in their late teens and early 20s to process multiple facets of information simultaneously. In television, success brings imitation. When MTV's ratings soared, other stations began to adopt the presentation format. CNN's Headline News was one of the first to transform its screens to showcase more than just the anchor. "When Mary Lynn Ryan, who was CNN's producer at the time, did this the news ratings skyrocketed," Grimes said. "So it appeared as though Robert Pittman was correct: if you are from 12-22 years old, your brain has learned how to process all these competing messages simultaneously, but people in their 30s and older have not learned how to do that." Bergen, however, hypothesized that Pittman's theory was not correct. The way people process information is not something that can be learned--rather it is a matter of perceptual grouping. "The human brain is today as it was in the 1880s, the 1580s and in the time of the Greeks and Romans. It has not changed," Grimes said. "We are no better able to parallel process conflicting information now than we were 300 years ago. So this notion that Pittman had that people have learned how to do that is nonsense." That last paragraph is a fine rejoinder to inflated claims about the ability to "multitask" (i.e., lose one's concentration by attempting to focus on too many things at once). Percy Heath, whose forceful and buoyant bass playing anchored the Modern Jazz Quartet for its entire four-decade existence, died yesterday in Southampton, N.Y. He was 81 and lived in Montauk, on Long Island. The cause of death was bone cancer, his family said. Mr. Heath recorded with most of the leading musicians in modern jazz, including Charlie Parker, Miles Davis, Thelonious Monk, John Coltrane and Ornette Coleman. But from the early 1950's through the middle 1970's, most of his recording activity and all of his live performances were devoted to the group known to its fans around the world as the M.J.Q. [T]he Post-it Note was more than just a practical tool--it was also a psychological one. Compared to the clunky machines of the 1980s that generated all those documents, it was a vision of high-tech minimalism. Its edges were sharp and square, with no ugly binding, no perforations, no metal rings. Its color, a subtle but attention-getting yellow, was somehow like the color of thought itself, a lightbulb going off in your head. Devoid of any other graphic elements, it had the effect of a clean, calming, blank screen. And, yet, for all its streamlined efficiency, it was playful and user-friendly . . . .
A decision of food pyramid revision may sound simple to some of us. . . .
Changing the food pyramid may seem simple. . . .
Could I live in your attic? Could I live in your pool? You can live in my laundry-room closet. Can I fit a tv in there? We thank the [Blanks] for their commitment to the cultural life of this entire region. We thank the [Blanks] for their commitment to the cultural life of our region. Or just the region, but the slight extra emphasis on the first-person plural is a nice touch. Here's a good exercise in reading: Seek out a crucial book from your childhood. Read it. The greater the distance between the book and you, the more interesting the reading will be. I've done such reading a number of times, most meaningfully with two formative books. I discovered Clifford Hicks' novel Alvin's Secret Code (1963) in the Boro Park branch of the Brooklyn Public Library in (I think) fourth grade and borrowed it endlessly (thanks, Library!). I bought Jay Bennett's novel Deathman, Do Not Follow Me (1968) in a Scholastic paperback edition in junior high school. I never went for the "classics" of children's literature; my choices were all my own. Clifford Hicks' novel tells the story of Alvin Fernald, who gets interested in codes and ends up cracking a coded message from the Civil War era (which leads to a buried treasure). In Jay Bennett's novel, high-school student Danny Morgan discovers a forged painting in the Brooklyn Museum. A psychologist might say that I was given to reading about characters who were a little older than me and had more interesting lives. I can't argue. Nor can I remember whether it was my boyhood fascination with codes that sparked my interest in Alvin or vice versa. Alvin Fernald had a warm, tingly feeling smack in the middle of his stomach. That sentence describes Alvin's anticipation on Friday afternoon before school's out. I liked everything about it when I was a kid, and still do. Not even the gray clouds that scudded across the sky, low and threatening with the approach of winter, bothered him. 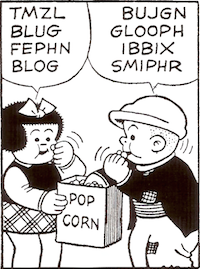 That's part of the coded message that Alvin's best friend Shoie finds crumpled up in the gutter. I knew a Milly in grade school, which might help to explain my fascination with that sentence. "SERIOUS MILLY HIDING THURSDAY" may have been my first exposure to language-poetry. He hunched his shoulders inside his jacket and jammed his hands into his pockets to keep them warm. I loved hunched and jammed. Sitting down on the curb, he dug through his jacket pockets until he found the stub of a pencil. I loved dug and stub, and I must have wished that my pockets were as deep as Alvin's. It wouldn't be an exaggeration to say that reading and rereading Alvin's Secret Code instilled in me a deep love of language. The only comparable childhood experience I can remember is my fascination with the word apoplexy when I read Treasure Island for school in sixth grade. "Soon be winter," George said. "Feel a cold one coming on. A real cold one." Danny thought of the expense of a new overcoat and didn't say anything. He would try to get through this winter with his old one but he was sure his mother wouldn't like it. Even though they needed the money, she wouldn't like it. "Feel it in my bones," George said. They held up quarters to the lamplight, and the silver coins shone and sparkled and almost laughed aloud. These passages (and I could add another half-dozen) may not look like great writing in any obvious way, but that they came back to me after so many years says something remarkable about Jay Bennett's ability to be evocative and, well, memorable. A final thing to do: If the authors of your favorite childhood books are living, write to them (real letters if possible, not email) and tell them what their books meant to you. (Start by looking online and in Contemporary Authors.) I was lucky enough to be able to write to and receive replies from Clifford Hicks (in 1997, when he was in his late seventies) and Jay Bennett (in 2003, when was 91, via his son). Telling these writers what their books meant (and mean) to me was like paying a large and longstanding debt. The section on Dylan's 1983 song "Blind Willie McTell" is as revealing an example as any of how Ricks can get lost in the minutiae of dictionaries and literary and biblical concordances while losing track of what the song is actually about. He discusses William Tell's arrow (since the first line of the song contains the word "arrow"), makes many references to the Psalms (not a bad hunch, since Dylan was still on the tail end of his fire and brimstone mode) and many asides to let you know that the Warren Professor of Humanities at Boston University and this year's choice for Oxford Professor of Poetry is aware of Homer's and Milton's blindness. "William Tell's arrow hit the apple on the head of the apple of his eye, his son. Since Mc means 'son of,' the son of William Tell may be living in another country under another name: William, or Willie, McTell." Over twenty pages of precious wordplay and meta-Dylan references (to "Gotta Serve Somebody"), Ricks does not even mention that Dylan was not merely summoning up William Tell or adding the "Mc" for any fancy reason, but that McTell was an actual blues musician and the song's true subject. Blind Willie McTell was not blind because of Milton but because he was blind from birth. And the McTell of the song was so named not because of William Tell but, according to legend, because a teacher at a school for the blind had mistakenly changed it from "McTear." Music and history don't exist for Ricks's own metaphorical convenience. Is it reasonable to wonder whether Ricks knows who Blind Willie McTell was? The original papyrus documents, discovered in an ancient rubbish dump in central Egypt, are often meaningless to the naked eye--decayed, worm-eaten and blackened by the passage of time. But scientists using the new photographic technique, developed from satellite imaging, are bringing the original writing back into view. Academics have hailed it as a development which could lead to a 20 per cent increase in the number of great Greek and Roman works in existence. Some are even predicting a "second Renaissance." Ron Silliman offers a reading list for anyone interested in the New American Poetry. You can find it by clicking here. 3703 students: If you want to follow some new directions in poetry beyond the work of our course, this list is a good starting point. Silliman's blog doesn't have links to individual posts. You need to scroll to April 7, 2005, to find the list. Correction: As RS notes, there are links. You can read the post on the New American Poetry by clicking here. Recognizing this growing epidemic, a bunch of enlightened folks organize a TV-Turnoff Week every year: http://tvturnoff.org. It's next week. So what are you going to do with all that time when you turn that TV off? Say: so many books, so little time! Opal Petty, whose lawsuit over her 51-year involuntary commitment in Texas mental institutions led to changes in state policy, died on March 10 in San Angelo, Tex. She was 86 and lived in Christoval, Tex. The cause was pneumonia, said Linda Kauffman, the wife of Ms. Petty's nephew, Clint Denson. Ms. Kauffman learned by chance at a 1986 reunion of her husband's family that Ms. Petty had been committed by her family to a state hospital in 1934, when she was 16. No one at the reunion knew exactly where she was at the time, Ms. Kauffman said in an interview, only that she was in some facility near where Ms. Kauffman lived. When she got home to San Angelo, Ms. Kauffman called the institution closest to her home--the San Angelo State School, in Carlsbad--and found that Ms. Petty was indeed confined there. She began to see Ms. Petty and arranged for her to make visits to the Denson home. The more she got to know Ms. Petty, Ms. Kauffman said, the more nervous and uncooperative school officials became. Eventually she sought legal advice and was directed to Jim Harrington, director of the Texas Civil Rights Project, who filed suit on Ms. Petty's behalf. Through pretrial discovery, it was learned that she had been given a diagnosis of schizophrenia. But her lawyers argued that at worst she had had a psychotic depression. They also said she had suffered irreparable harm from being held in a "prison-like environment" for so long. Dr. Jefferson Nelson, an Austin psychiatrist, testified, based on Ms. Petty's records and a personal examination, that she was psychotic when she was admitted, but that her symptoms quickly subsided, and that she should have been released. He also testified that as a result of being institutionalized, Ms. Petty was afflicted with an "institutional syndrome" that left her withdrawn and unable to express emotion. . . .
Mr. Harrington said: "Being fundamentalist Baptists her family didn't approve of her wanting to go out dancing and such things. A church exorcism didn't work, so the family made the decision to commit her. One of her girl friends said she didn't see anything wrong with her." After Ms. Kauffman found her, Ms. Petty was furloughed from the state school and lived with Ms. Kauffman and her husband for almost 20 years. She was employed at a workshop for people with mental disabilities, and bought dolls to add to a collection she had started while confined. "They were her family," Ms. Kauffman said. "When she was buried she was surrounded by her dolls." You can read the complete New York Times obituary by clicking here. If you've ever used Microsoft Word, chances are you've seen that jagged green line appear beneath something you've written--scolding you for drafting a fragmented sentence, maybe, or for slipping into the passive voice. That's Microsoft's grammar-checking technology at work. But how much good does the grammar checker actually do? Precious little, according to Sandeep Krishnamurthy, an associate professor of marketing and e-commerce at the University of Washington. After experimenting with the tool, Mr. Krishnamurthy concluded that it cannot identify many basic grammatical faux pas--like errors in capitalization, punctuation, and verb tense. Now he has dedicated himself to chronicling the grammar checker's blind spots, and to persuading Microsoft to improve the tool. On his Web site (http://faculty.washington.edu/sandeep/check), Mr. Krishnamurthy has posted evidence that he considers damning: a series of examples of poor grammar the software considers passable. One reads: "Marketing are bad for brand big and small. You Know What I am Saying? It is no wondering that advertisings are bad for company in America, Chicago and Germany." Microsoft officials did not respond to calls for comment. . . .
Editor's note: The headline on this article cleared Microsoft's grammar checker. By the way, you can easily be rid of jagged red and green lines: go to Tools, Options, and Spelling & Grammar to turn off the automatic (and annoying) spelling and grammar checkers. Then just hit F7 when you want to check spelling. The games drew about 15 chess enthusiasts to a windowless conference room at City College in Harlem, where pawns and rooks were moved with such intensity of purpose that the scene could have passed for yet another high-stakes tournament. The grandmaster and bona fide chess luminary Maurice Ashley was there, calling out commentary as he often does when championship matches are broadcast around the world. He is known to use lines like, "Pawns are attacking mercilessly!" and "The bishop is slicing and dicing!" But what Mr. Ashley had to say about chess on this night was more academic. Literally. "A lot of times in education we try to teach kids the one right answer and that leads, in my opinion, to robotic thinking," he told the players, encouraging them to think of multiple possible moves before choosing the best play. "Real life isn't like that. Is there ever one right answer? Generating alternatives for the sake of alternatives is a good thing." From an article in the New York Times on "Introduction to Logical Thinking Through Chess," a course for NYC teachers. You can read the article by clicking here. 3009 students: What's the most valuable thing you learned from reading The Grapes of Wrath? To respond, click on the comments link below, and then click on Post a Comment. For your identity, choose Other. You can add your name or leave it blank if you prefer. As replies come in, they'll be available to read by clicking on the comments link for this post. "Now I realise for the first time," wrote William Faulkner to a woman friend, looking back from the vantage point of his mid-fifties, "what an amazing gift I had: uneducated in every formal sense, without even very literate, let alone literary, companions, yet to have made the things I made. I don't know where it came from. I don't know why God or gods or whoever it was, selected me to be the vessel." 3009 students: Here are the links. Thanks to everyone who contributed. Just how cheap is Chinese labour? The read-in, organized by groups including Code Pink and the Salinas Action League, began Saturday afternoon and included a pitched-tent sleepover on the lawn of the Chavez library and readings by authors including Anne Lamott and Maxine Hong Kingston. No! A relationship is a 50-50 thing, Kevin. The class presentations were surprisingly thorough and interesting--not at all the sophomoric commentaries I had expected. Sophomores get a bad rap. A lot of people seem to think they're foolish (no matter what they do), when they know they're pretty wise. The history of the words "sophomore" and "sophomoric," which developed from "sophomore," proves that it has always been tough to be a sophomore. Those words are believed to come from a combination of the Greek terms "sophos" (meaning "wise") and "moros" (meaning "foolish"). But sophomores can take comfort in the fact that some very impressive words, including "philosopher" and "sophisticated," are also related to "sophos."